Ten pieces. Chicken wings are all natural and marinated in our own special power pizzeria marinade sauce then baked to perfection. Five pinwheels. Delicious dough rolled up and filled with delicious toppings. Served with a side of marinara sauce. Twelve pieces. Delicious power sticks topped with a mix of cheddar and mozzarella. Twelve pieces. Made with our fresh, delicious dough topped with warm melted butter and parmesan. Mixed greens, romaine lettuce, green pepper, onion, cucumber, tomatoes, baked chicken, and power croutons. Spinach, walnuts, crumbled blue cheese, red onion, and cranberries. Romaine lettuce, cucumber, tomatoes, pepperoncini, capers, red onions, black olives, green peppers, and feta cheese. Delicious power dough filled with mozzarella, ricotta, and your choice of toppings. Mozzarella cheese, onions, black olives, green pepper, mushrooms, and tomatoes. Penne and marinara sauce with chicken and meatballs, topped with mozzarella and parmesan cheese. Served with two garlic rolls. Penne, alfredo sauce, and baked chicken. Served with two garlic rolls. Penne tossed with ricotta, parmesan, and marinara sauce. Topped with mozzarella and served with two garlic rolls. Spinach, baked chicken, walnuts, crumbled blue cheese, red onions, and cranberries with house vinaigrette. Baked chicken and lettuce topped with parmesan cheese and Caesar dressing. Baked chicken topped with cheddar cheese, bacon, onions, and ranch dressing. Tomatoes, red onion, mushrooms, green pepper, and black olives. Pepperoni, green pepper, black olives, tomatoes, and red onions. Oven baked chicken and bacon covered with mozzarella and cheddar cheese on top of alfredo sauce no red sauce. A blend of cheddar, mozzarella, parmesan, and crumbled blue cheese on top of our power crust no red sauce. Oven baked chicken, red onion, and bbq sauce. 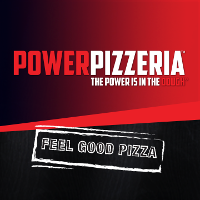 With homemade power pizzeria sauce, part skim mozzarella, and our revolutionary protein fortified power dough. Power sticks tossed in butter and coated with cinnamon sugar, served with a side of frosting.